A successful business relies heavily on smooth information sharing and effective knowledge management within an organization. To achieve efficient client-to-client and device-to-device file sharing, a solution providing smooth cross-platform file sharing becomes essential. QNAP Turbo NAS is designed for high performance file sharing over various network protocols. Supporting SMB/CIFS, AFP, and NFS, the Turbo NAS enables seamless file sharing among computers of different operating systems without the worries of incompatibility. 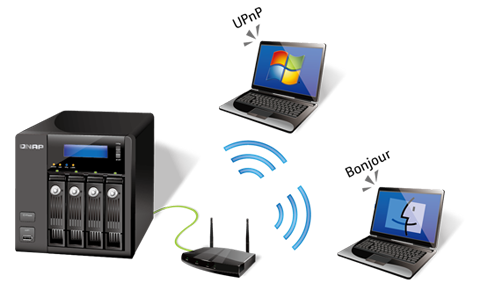 The Turbo NAS can advertise its services to the network for easy sharing and access. By enabling the UPnP discovery service, the Turbo NAS will show up on any computer or mobile device that supports UPnP. The Turbo NAS is also capable of broadcasting services through Bonjour protocol for convenient access within the “Finder” on Mac computers. The zero configuration networking enables easy network access from the computers, mobile devices or any Wi-Fi access point to the Turbo NAS and easy data sharing. Nowadays, businesses demand the capability for large file transferring to customers or partners. The Turbo NAS makes this task simple by providing the FTP Server feature that is easy to set up and provides high-speed file transferring. Multiple user accounts can be created to allow your colleagues, partners or customers to upload files to and download files from the Turbo NAS. Advanced settings such as “anonymous login”, “FTP with read/write access”, “FTP write only” and “bandwidth control” are provided to offer IT administrators’ greater flexibility. 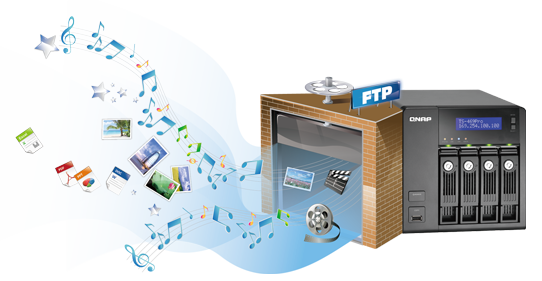 To enhance security the Turbo NAS also supports FTPS (FTP over SSL/TLS) for secure file transfer. The File Manager brings conventional file operations performed on the computer desktop all to the web browser. Users can upload, download, and manage files anywhere with a web browser. File extraction, folder creation, and smart search for files and folder are supported and functioned over the Internet. 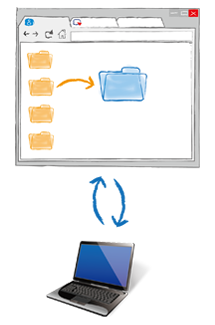 This management platform makes file management on the Turbo NAS much easier, saving more time to increase productivity. It is more than just a disk on the local network. As long as getting on the Internet, using the Internet browser, users can manage the Turbo NAS files anywhere and anytime. The File Manager also facilitates centralized management of documents. 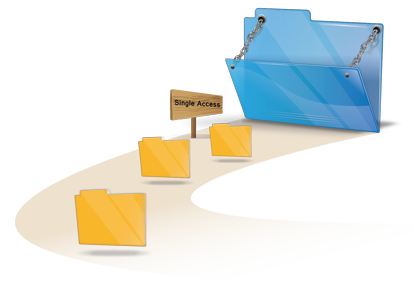 Advanced folder permissions access rights of users and user groups can be configured easily, enabling folder or sub folder permissions to be setup from Microsoft Windows ACL or the web-based management interface of the Turbo NAS without complicated procedure. There are numerous ways to share files over the Internet. Among them a single download link is considered to be the most convenient way. The QNAP File Manager now allows the sharing of multiple files with unique URLs that can be clicked to download without requiring any user login. This eliminates complicated privilege configurations and login process. Security is ensured with SSL and password options. The Turbo NAS owner can also set an URL expiration time for the shared URLs. Uploading large-sized files via a web browser used to be a nightmare. The File Manager now supports uploading large-sized files with a web browser thanks to the Java technology. WebDAV is a technology based on HTTP. By enabling the WebDAV service on selected shared folders on the Turbo NAS, users can then remotely access the server and manage files simply by drag-and-drop. Performing like using local drives, WebDAV also allows users to edit and save files directly, avoiding redundant work to download the file to local computer and then save it back after modifications. With 256-bit AES SSL encryption, WebDAV ensures data security and data privacy, preventing data from theft or hacking. Furthermore, WebDAV provides faster transmission speed than Microsoft networking(SMB/CIFS) over VPN. Thinking about efficient file sharing among multiple shared folders in different servers, PCs, or storages? 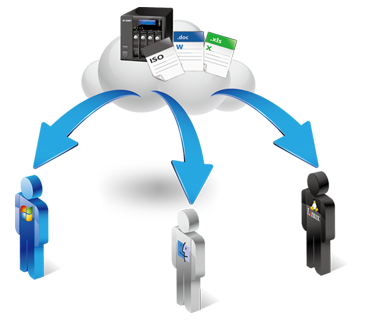 The shared folder aggregation allows IT administrators to create a portal folder and aggregate multiple shared folders from different IP addresses to the portal folder. It performs like a hub to centralize the access points to a single one from different IP addresses, thus helps prevent the overwhelming work for users to identify lots of IP addresses and log in respectively. Being easy to manage and share files in Windows Active Directory environment, shared folder aggregation enables Windows AD users to access all the resources from a single access point conveniently, with only one user account. While ISO images of CD and DVD discs have become common ways of recording data, many businesses are encountering more and more issues managing ISO images of CD and DVD discs. The Turbo NAS supports mounting ISO images of CD and DVD discs as network shared folders for data archiving, storage, and sharing. This feature saves space for storing the physical discs, reduces the risk of data loss caused by disc wearing and tearing, and enhances the performance of data sharing on a business network. 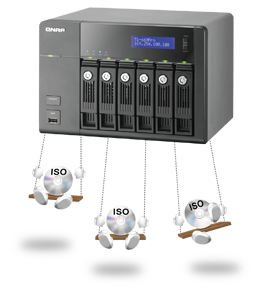 Networked ISO file archiving and sharing help businesses manage ISO images more efficiently, safely, and in a more organized manner.